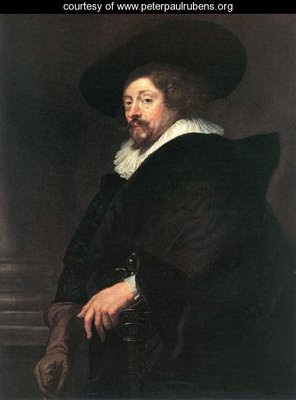 This self portrait by Rubens draws me back again and again, for the drawing rather than the painting. In this case by "drawing" I mean the proportions and the solid sense of three-dimensional form. The bulk of the body is exactly right, as shown by the left hand in its placement and size, and the right hand, and the placement and size of these light areas against the dark robes. Together with the exact right distance from the head, these "facts" tell you all you need to know. It is masterful, it is magnificent, and I never get tired of looking at it. The bulk and the rightness give me an aesthetic buzz the way a sequence of chords gives pleasure in music. I suppose this makes me an art nerd. This is a broad definition of drawing. Drawing is often interpreted much more narrowly, being limited to "lines" or the "shading" (a word that makes me cringe). I think of drawing as everything except the colour, but in actual fact I don't make much of a distinction between drawing and painting at all, and in things like portraits it's mostly about the drawing, whether with paint and brush or by other means. As an aside, the expression "out of drawing" means that a drawing is off in some way, usually proportions or foreshortening, similar to what "out of tune" means in music. When a figure drawing or portrait is out of drawing, it makes the person look deformed, it may be ever so slightly, for instance the gaze of the two eyes. If you have to wonder it is probably wrong. The sad thing is that the artist is often unable to see it, such is the nature of the artist's ego. In figurative painting the drawing shows, it can't hide. But Rubens had no need to hide his drawing, he was one of the all-time great draughtsmen. For proof, check out Daniel in the Lion's Den. All those heads and paws and hindquarters and jaws at every angle and in every variety of foreshortening imaginable -- he makes it look easy but it sure is not. 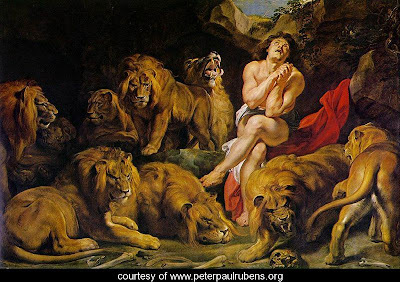 I could draw a lion in the zoo for years and years and not get one paw down as well as Rubens has got eight whole lions in one painting. He may have had an ability to see and rotate three-dimensional forms in his head the way some computer programs can create rotating 3D models. It's possible, if one has the gift plus training and practice. A lot of drawing is just getting things in the right place, but it is very hard and goes wrong as often as not. So celebrations are in order when it does go right.